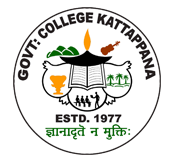 The Post Graduate Department of Malayalam has been an integral part of the college throughout these years. The department was established with the inception of the college in 1977.It had been only a subsidiary department for almost sixteen years. As a result of the sheer perseverance of the then HOD , Prof.Baby Raj and the staunch support given by the local public, the BA degree of Malayalam was sanctioned by the Govt. and the course was inaugurated on the 1st of November 1993. It gave tremendous opportunities for the young generation of the high ranges to pursue their aspirations in language and literature. The PG in Malayalam started in the year 2000 to enhance the improvements of the students. The department has produced the best results in academic and co-curricular activities. A lot of media persons, politicians and academicians were the students of the department. The department has been a pioneer in the new initiatives of the college. We conducted National Seminars in the last five consecutive years. A well planned International film festival for students is fixed in the month of December every year. A young and vibrant unit of teachers is the greatest asset of the department. Then the department plays a vital role in the development of the college.